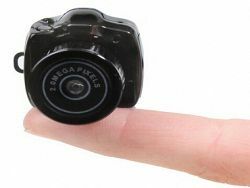 Hammacher Schlemmer company, which is famous for its exotic products, introduced the world’s smallest camera. The device weighs is only 15 grams, and is possible to place it at the tip of your finger because the camera exceed a little dimensions of 25 mm in all directions. Novelty has a 2 megapixel matrix, a slot for flash memory cards with capacity MicroSDHC up to 32GB, and also interface USB. Camera allow shoot JPEG image at a resolution of 1600 × 1200 pixels and records video in AVI format at a resolution of 640 × 480 pixels and 30 frames per second. Mini-camera battery charging carried out through USB-port. According to developers, one charge is enough for 30 minutes of continuous shooting. The cost of the camera is $ 100, the package includes MicroSD-card for 2 GB. Earlier Sony’s European division has been launched production of the world’s finest camera Cyber-shot TX55. Its thickness is only 12.2 mm. However, despite the slim design, novelty crammed with all sorts of functionality.